Universal Pictures Home Entertainment is making plans to bring us Amblin’s delightfully thrilling tale of a mysterious house where things are not what they seem to be. The studio scheduled a 4K UHD and Blu-Ray Disc for release in December. 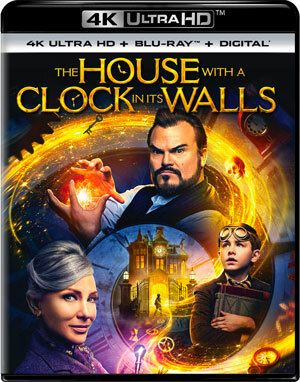 Full of wonder and adventure, The House With a Clock in its Walls mesmerizes audiences of all ages and keeps the magic alive when stars Jack Black, Cate Blanchett, and Owen Vaccaro arrive as Uncle Jonathan, Mrs. Zimmerman, and Lewis Barnavelt. In the most unexpected places, fantastical events, miraculous twists and suspense filled moments ensue in this adventure that soon captivates kids and adults alike. In the movie, Lewis Barnavelt (Owen Vaccaro) goes to live with his Uncle Jonathan (Jack Black) in a creaky and creepy mansion with an eerie tick-tocking heart. But when Lewis soon finds out he’s in the presence of magic practiced by his uncle and neighbor Mrs. Zimmerman (Cate Blanchett), his new town’s dreary aura boosts to life in an exciting and dangerous way. The release will be jam-packed with bonus features, starting out with a Commentary Track by Director Eli Roth and Actor Jack Black, as well as an Alternate Opening and Ending with optional Commentary by Eli Roth and Jack Black, and a Gag Reel. The bulk of the release is made up by a series of Multi-part Featurettes, such as Warlocks and Witches, Movie Magic, Owen Goes Behind the Scenes and Eli Roth’s Director Journals..
Further, there is the Theme Song Challenge, in which Eli Roth and the cast are challenged to come up with a theme song for the film, and Do You Know Jack Black?, in which the cast compete with each other to see who knows Jack Black the best. Abracadabra! shows Eli Roth performing a magic trick for Owen Vaccaro, while Jack Black’s Greatest Fear lets viewers in on a prank that Eli Roth and Owen Vaccaro play on Jack Black. The Mighty Wurlitzer is a featurette highlighting composer Nathan Barr’s work on the film as he discusses how he created the film’s unique and distinct score. The Featurette Tick Tock: Bringing the Book to Life is also part of the release, as well as a host of Deleted Scenes with optional Commentary. The House With a Clock in its Walls arrives in stores on December 18 for $39.99 on 4K UHD, $34.98 on Blu-Ray Disc and $29.98 on DVD.